Oh yes, we had to buy the tiki mug. But more on that below, let’s get to the drink first. 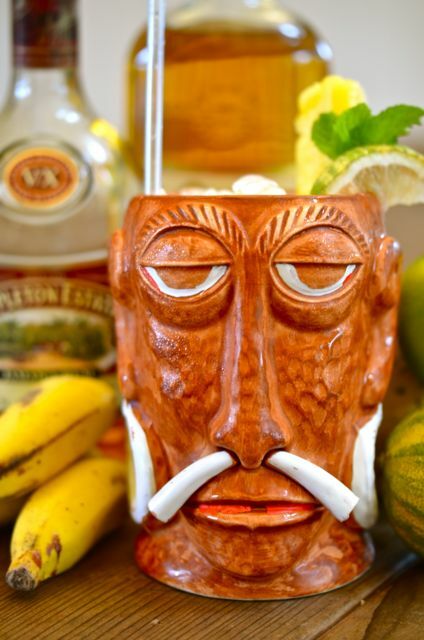 The Sumatra Kula is a tiki drink from Don The Beachcomber, who along with “Trader Vic” Bergeron led the tiki craze in the 30’s, 40’s and 50’s. If I can summarize, Don was the Socal guy, Vic was the Norcal guy. Both liked rum and created lots of tiki drinks. Vic had the Mai Tai, Don had the Zombie. Both created chains of bar / restaurants in very un-tropical places- most, but not all, are gone now. But tiki is coming back and many of Don and Vics’s drinks are coming back as well, and we think that is great news. As for the Sumatra Kula, this is supposedly one of Don the Beachcomber’s first tiki creations from the 1930’s. And as it was early in his career, the recipe is still very simple. But this is a tasty drink and has the added bonus of using ingredients that are easily available. The Sumatra Kula combines lime, orange, grapefruit, honey syrup, light rum and crushed ice. The honey syrup is a 1-to-1 mixture of honey and water, heat until the honey dissolves, thus making it easier to mix in drinks. And in this drink the honey is the key, surprise ingredient. It is sweet, but clearly not sugar, and brings that mystery to the drink. The other thing you will notice is the use of just light rum, as tiki drinks evolved multiple types of rum were used for extra complexity. As it is, the light rum lets the fruit juice shine- so this is a nice refreshing tiki drink. As for the tiki mug, it comes from the Bali-Hai restaurant of San Diego. The restaurant was founded in the Fifties and was originally called “The Hut”, but then changed the name as they expanded. The Bali-Hai has a newly renovated flagship restaurant, we haven’t been, but we saw some pics and they still use these mugs for drinks made for two. Ironically, we found this mug in Hawaii, go figure. Combine all ingredients in a cocktail shaker and shake vigorously. Pour into Tiki mug or highball glass. Top with more crushed ice if needed. Garnish with lime, pineapple spear or mint, if you like. Serve. Stewart – looks like you are having too much fun. However, I am assuming some of these drinks will be on the menu this summer! Looking forward to a festive Tiki beverage..
Hey, I hope you and the crew are doing well! And you will get any tiki drink you want! Hi, We have been to Trad’r Sam’s (maybe more than once..;-) it’s a trip. Worth a visit. Thanks for reading! Hey, a tiki drink I will like! So many of them have pineapple in them, and I can’t stand it, so thanks for posting a great-sounding, pineapple-less tiki drink! I will definitely try this. Thanks for reading! 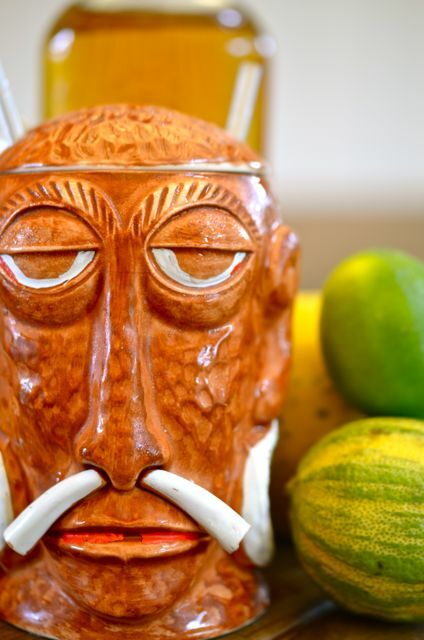 There are more tiki drinks w/out pineapple than you might think- the real Mai Tai, Navy Grog and Planter’s Punch are all good examples (at least if made with the real recipe). You will see these drinks on the blog over the summer.. The Bali Hai in San Diego was not part of a “Bali Hai chain of tiki restaurants.” Although there were other places in the US called Bali Hai, they were not owned by one company. However, the Bali Hai in San Diego was originally called The Hut, and that was a small chain.